What it’s about: Though Lenny has resolved to live forever, his plans for immortality are complicated by several unavoidable matters. First there’s the problem of his appearance as a visibly middle-aged, balding man whose attention to fitness and healthy eating has not been up to current standards. Secondly, though his income certainly puts him above the Low Net Worth Individuals, he still hasn’t saved enough to have Smart Blood pumped into his veins to rehabilitate his deteriorating body. And now he’s been pegged by the American Restoration Agency for potential sedition, all because he told Jeffrey the Otter he’d slept with “some Italians” and the ARA mascot logged it as Somalians. After they dragged that fat man off the plane for un-American activities, Lenny doesn’t know how he’ll ever fit in to the culture of youth, data, Images, and technology. His one and only bright spot is the young and beautiful Eunice Price, an emotionally damaged Korean woman whose fragility attracts Lenny. He becomes determined to make her love him, not only because he is attracted to her, but because she can undoubtedly increase his Physical Rating by sheer proximity. What follows is a super sad love story, told in the alternating perspectives of Lenny’s long-form journal and Eunice’s emails and chats to her friends and family on GlobalTeens. Both Lenny and Eunice hate and love one another, seeing in the other something they want but can never have. Eunice sees Lenny as cultured and smart in an almost embarrassing way, but values him as a truly good person, though his goodness leads to an intensity she’s unable to handle, as most of her interactions are via the internet. But the story is bigger than Lenny and Eunice. Around them the world starts to unravel and they will discover if their relationship is made from something real. Would I recommend? As you may have noticed, I am drawn to the post-apocalyptic. I loved Margaret Atwood’s Year of the Flood, Jasper Fforde’s Shades of Grey, and even The Hunger Games has a bit of that world-exploding flare. My love of this genre is nothing new though. I was reading 1984 and Brave New World long before “dystopia” was the buzzword of all things cool. 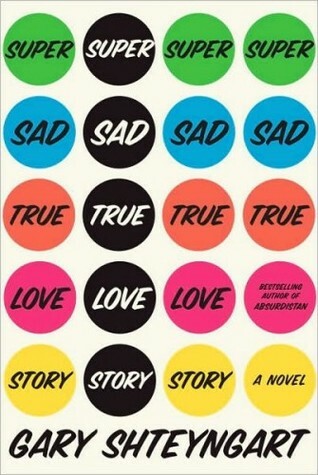 So when my mother recommended Super Sad True Love Story to me I was, of course, excited. The book has not let me down. The allure of dystopia is in imagining what could be, shuddering, and becoming determined to avoid it.